Sunday 2nd September was the last race of the LWCR League. The winning individual rider and team for 2012 had already been decided; however there was still time for everyone else to add to their totals. Riders were expecting a reasonably rolling course around the Surrey lanes but were forced to use a the much hillier Cutmill circuit after some unexpected road works on the course. Much to the delight of some, but the dismay of others, the finish was on a selective climb which was likely to break things up before the final laps. The group is together up the finish hill on lap 1 though the effort is already starting to show for many (thanks to Colin Addison for the pic). 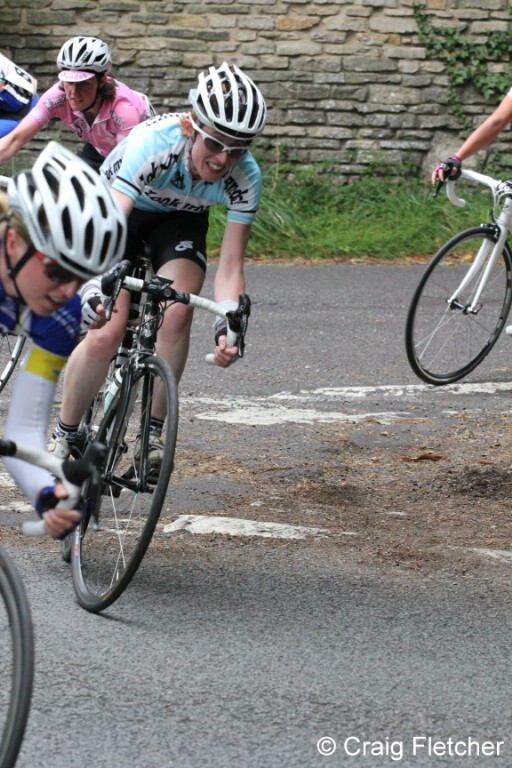 There was strong presence from the WyndyMilla girls who were keen to seal Emily Bagnall's second place in the league. As well, the consistent force of the Pearson CC crew were welcoming back Helen Rolston after a nasty accident she suffered in training earlier in the summer. The race was six and three-quarter laps of a seven mile circuit and the final climb started at a gentle 2-3% but quickly took itself to 8-9% before levelling out over the finish line then kicking back up. Apart from this climb the course was fast, where strong, powerful and assertive riders could make their mark. Early on the first climb, the pace was set by the likes of Alexie Shaw (Dulwich), Maryka Sennema, Jasmijn Muller (both Kingston Wheelers), Julie Granshaw (WyndyMilla) and Clemence Copie (High Wycombe CC). It was no surprise that in lap one the race stayed together with riders feeling fresh but into lap two Karla Boddy from HWCC put in a dig to chase down Jasmijn who had distanced herself from the bunch in the rolling section. Her strong effort kept Jasmijn away for a couple of miles and she became part of a few riders who drove the pace hard over the climb with Anna Grundy (LMNH) taking a lead in setting this. This move initially saw the peloton break from its 26 riders into a group of four including Anna Grundy, Maryka Sennema, Karla Boddy and Emily Bagnall. But the quartet were quickly followed by at least half a dozen other riders and it looked like this group may get some distance. However, the remainder of the bunch worked together and bought it all back to neutral as they headed out of the first three laps. Maryka Sennema took control of the pace on the hills with Alexie Shaw and Anna Grundy never far away, this pace setting was enough to leave only 13 riders going into the final lap at which point WyndyMilla stepped up and drove the pace over the final rolling sections. Taking a sweeping left into the steady gradient of the finishing climb it was Anna Grundy who first took some bike lengths out the finishing group about 400m before the line. As the gears kicked down and the gradient kicked up the field broke up and Emily Bagnall saw her opportunity and drove hard over the steepest part of the climb. Karla Boddy followed late but managed to bridge across and take 1st on the line from Emily with Anna in third. Race winner Karla Boddy (far left in blue and yellow), 2nd place Emily Bagnall (behind in pink) and 3rd place Anna Grundy (light blue) navigate possibly the sharpest most potholed corner in all of Surrey (picture courtesy of Craig Fletcher). Speaking with Karla after she said "I feel a touch awkward winning in this situation, after lap two I was suffering but not in the usual way. Feeling unwell I thought about withdrawing but carried on. I even had 3 caffeine gels which I only have in my pocket as back-up and never use that many in a race! I couldn't contribute at all after the early laps knowing it would likely finish me off before I got to the line but I managed to nip round in the finish. I would have liked to contribute more and win knowing I helped the dynamics of the race but its not always possible. As always the usual suspects rode really well, credit to Jasmijn and Alexie who injected most the pace on the front along with Julie from WyndyMilla. 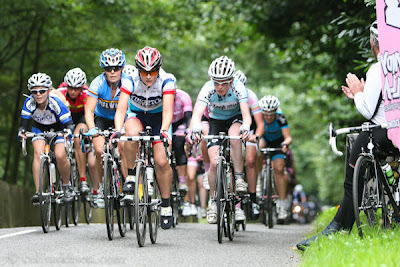 And thanks to LWCR and WyndyMilla for organising a safe and enjoyable event." 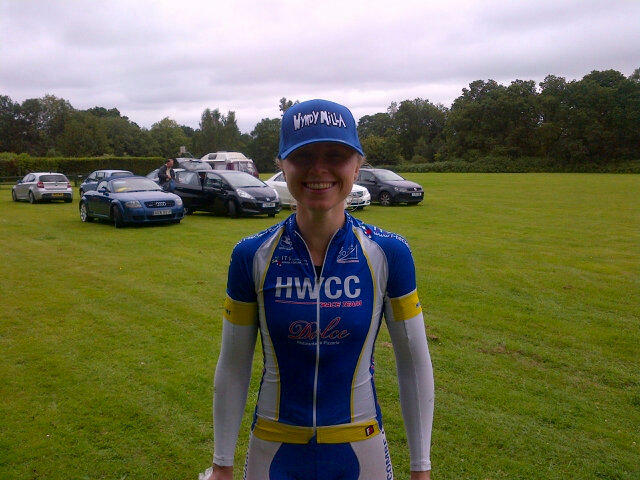 Race winner Karla Boddy of High Wycombe CC in her Wyndymilla prize hat. With that, the race rankings are finalised with Lydia Boylan of Look Mum No Hands! RT winning the overall individual by 8 points from Emily Bagnall, and the LMNH team winning the team rankings. Third place individual was Astrid Wingler of London Phoenix with Wyndymilla UK Youth team finishing second, ahead of Pearson CC. Stay tuned for news of our awards night to be held at the Rapha cafe in London.